Homeschooling Unscripted is giving away Exploring Creation with Biology with Solutions & Tests (Retail $85) by Apologia!! I have always wanted to check some of those out!! Have you ever typed up a LOOOOONG paper or post or whatever and then hit the wrong button only to have the ENTIRE thing wiped out??? Yeah, well… that just happened to me. SIGH…. Maybe I should type the posts on Google Doc and then copy and paste! LOL At least then if I hit a wrong button it will still be there!!! I started a new sewing project yesterday. I am soooo excited about it!!! I am planning on entering the Crafterhours Skirt Week contests! I am making this for the full skirt. I know it’s a dress pattern but I am adjusting it to make a blouse and skirt! I just love the vintage look of it! 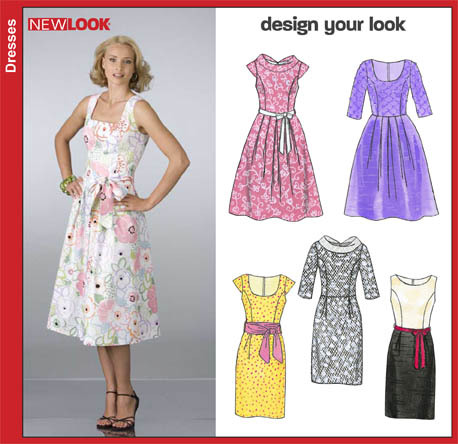 I am making the pink dress style and the fabric I am using is GORGEOUS!!! I wish I could remember the name of it! LOL I found it on sale at Joann’s. Here is the skirt I will be entering for the straight skirt category. I finished it up Tuesday. Here are some pics of some of my past sewing projects. I hope to eventually add tutorials for most of them. Until then if I used a tutorial I will try to link you to it. Most of them can be found on my Pinterest. I LOOOOVE that site. I am just a tiny bit addicted…. This one was from a pattern – Easy McCall’s M6197 – I just changed it here and there to suit my needs. Here is a pick of it actually on C1. This is one of those winging it dresses. LOL I just knew what I wanted and set about trying to make it. And all the material came from the remnant bins at Joann’s!! It cost less than $8 to make the whole thing! The most expensive thing was the eyelet! This one came from McCall’s LolaLou M6271. It was very easy to make and looks so cute! I made myself a maxi dress to sort of match.